LocksOnline is proud to announce some new additions to our inventory! We have a new range of exciting door locks that are like no other, our range of VF and VS Magnetic Door Handles. This fantastic device combines both a magnetic lock with a sturdy and durable handle, giving you a handle and locking device in one slick unit. This can be used on any material door; glass (with additional bracket, UPVC, metal, composite or wood. 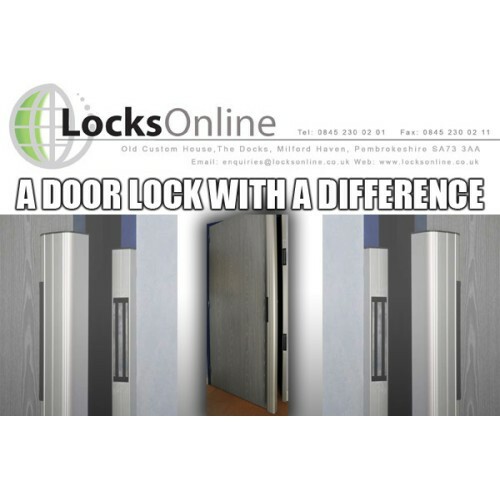 Available in 300KG and 600KG holding force versions, this device is far superior to most magnetic locks as the bulk of the holding force is located in the middle of the door frame, not to the top as most magnet locks would be fitted. This prevents the door from being levered open at the bottom of the door. Available in sizes to suit you, can be ordered in 400mm length, 600mm length or the full length 2.5metre unit that can be cut down to fit any door with a height of 2500mm or less, there are very few doors that this unit will not fit. Installation is quick, easy and can be accomplished in as little as 10 minutes by a professional. Powered by either 12 or 24vDC power supply unit (available separately) this is a very versatile unit that can work in combination with a huge variety of access control devices. As with the majority of magnetic locks, this device comes in fail-safe mode, meaning that when power is disconnected from the system the doors will unlock. Perfect for doors that may need to be released automatically in the event of an emergency. By installing a battery backup into the power supply unit you can also ensure that should the power to the building fail, the door can still remain secure for several hours until local electricity is restored.